One hundred and twelve years ago residents of what is now Free Union were looking forward to an event which would put them on the map. A movement was afoot to establish a post office in the Albemarle County village. Up to that time the village was known Nicksville . But since another city called Nixville existed in the county, one of the first obstacles was to rename Nicksville to avoid any conflict at the two post offices. Villages rarely were named when they formed in early days. They began as settlements and acquired names as they grew. Nicksville is said to have been named after a "Free Black" who ran a blacksmith shop in what is now the center of the village. Several legends appear regarding selection of a name for the new post office but some of these stories are doubtful. In 1847, about 10 years after Free Union Baptist Church was built in what is now the village, the center of the community was about two miles west of the present site and was as Thompson's neighborhood. It had a store and a church building (the old Garrison Meeting House). 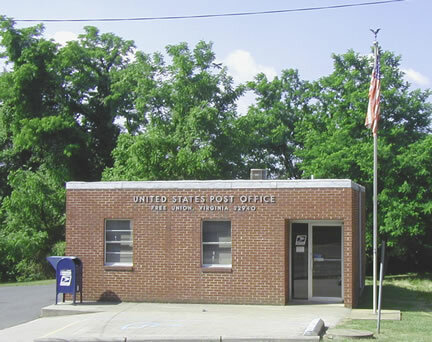 With the growth of Nicksville, the post office was established and it was placed in what is now Free Union. We don't know who chose the name but it was named after the Baptist church. The church was built as a Union church and was free. Free Union Church is mentioned in old records and papers before the post office was established. For some time afterwards, Free Union remained a post office designation only. The older folks still called the town Nicksville even up to the turn of the century. A list supplied by the General Service Administration in Washington, D. C. gives the name of Henry Harris as the first postmaster at Free Union. He received the appointment on March 8, 1847. He was a member of the family which settled at Free Union while it was still a part of Louisa county. The exact location of the post office operated by Harris is not )known. He is said to have lived at Herndon House, which burned a few years ago. Harris held the post until Nov. 5, 1852, and Samuel Payne took over until Feb. 2, 1853. James L. Eagon succeeded Payne. In April 1856 , James Wayland succeeded Eagon and in June 1860, Joseph R.Thompson succeeded Wayland. Thompson held office until 1866, mostly in name only. The post office actually was discontinued July 9, 1866, and reactivated on March 26, 1867, because of the Civil War, thus, Thompson was on the federal books as post master but had little to do. Bernard B. Thompson took over as postmaster when the office was reactivated in 1867 . He served until Dec. 10, 1870. Lewis T. Rogers, like the Thompsons, was a member of the early families of area . He took the job of postmaster in 1870 . After five years, John F. Elliott took the job. He was succeeded about a year later by Robert Dettor. Then a little more than a year later, William B. Yager held the office. In 1880, the postmastership went to Thom. M. Cosby. He served until Much 20, 1882, when Miss Virginia Yager took the post. There appears to be some confusion in the records here since 10 days later a Mrs. Virginia L. Yager was listed a as postmaster. Perhaps they were the same person and the name was listed again as to correct an earlier error or perhaps Miss Yager married or maybe there actually were two different persons : a mother and daughter. Mrs. Yager held the job for eight years. Rosa L. Martin succeeded her on Sept. 27, 1890. She held the job until John B. Cox was appointed in 1897. John Cox was succeeded by Charles B. Coxon Feb 21, 1901. A father and son held the office for more than a quarter century after Charles Dox. James Elliott took over on June 7, 1902, and his son, Andrew M. Elliott on Oct. 1, 1914. Dr. William A. Kyger was appointed postmaster to succeed Andrew Elliott on Oct. 1, 1928, and held the job until 1934. It was here that Cecil A. Maupin entered the picture. He acted as assistant postmaster and later was appointed postmaster. In 1964 he retired. Maupin has served longer than my others : 26 years in all. He is the 20th postmaster in 112 years. With the relocation of Maupin Brothers Store into a new building here last week, the Free Union Post Office went along. Mail service in the 112 year period has improved right along. At the beginning, mail was delivered weekly. Later it was changed to twice a week and still later, to three times a week. Today, residents get mail every day except Sunday and holidays. William Winston Wilberger was born down the hill on Page Street in Charlottesville, (1921). William Thomas Wilberger and great grandfather (Dorsey H.Wilberger) are from Free Union where they operated a sawmill, Wilberger's still have family there living at the old home place. The man sitting at the wheel is William Thomas Wilberger, the others to his right are his brothers and his sister Winnie. The smallest fellow on the seat (Jack) is still living there in the county. The older man standing behind hood is Dorsey H. Wilberger, he's buried there at a small church cemetery across from where he lived in Free Union. The license plate date is 1918 and the truck is a Republic.